Vikings running back Adrian Peterson is third in the league in rushing with 1,226 yards. EDEN PRAIRIE, Minn. — Leslie Frazier isn’t sure he’ll let Adrian Peterson talk himself into the lineup with only one game remaining in the Minnesota Vikings’ season. Peterson, playing through a sprained right foot and lingering groin injury, practiced on a limited basis all week, but Frazier said Peterson will be doubtful for Sunday’s home game against the Detroit Lions, the final game in the Metrodome’s history. "He was OK," Frazier said of how Peterson looked in Friday’s practice. "Did OK yesterday. Probably put him at doubtful for this game, but we’ll see what happens tomorrow." Peterson, who is third in the league in rushing with 1,226 yards, sprained his foot on Dec. 8 and wanted to play the following week at home against Philadelphia. But Frazier took the decision out of Peterson’s hands and didn’t let the MVP running back play because of the foot injury. Asked if he was going to let Peterson talk him into playing this week, Frazier said, "Probably not, unless something dramatically changes." Backup Toby Gerhart is out for Sunday’s game after re-injuring his hamstring in last week’s game, which could leave Matt Asiata as Minnesota’s top running back on Sunday against Detroit’s fourth-ranked run defense. Asiata played on Dec. 15 when Peterson and Gerhart were both out, and had 30 carries for 51 yards and three touchdowns in the Vikings’ 48-30 win against the Philadelphia Eagles. "Just going in with the same mentality," Asiata said. "Just go in there and try to win, score touchdowns and move the ball and get some first downs." Linebacker Audie Cole (ankle) was placed on injured reserve on Friday and the team signed cornerback Robert Steeples from the practice squad to the active roster. Defensive tackle Letroy Guion (quadriceps) is doubtful after not practicing all week. Cornerbacks Xavier Rhodes (ankle) and Shaun Prater (ankle) will be questionable. Both were limited in Friday’s practice. Asiata (ankle), linebacker Larry Dean (knee), defensive tackle Fred Evans (knee), safety Harrison Smith (foot/groin), cornerback Chris Cook (knee), fullback Jerome Felton (knee), guard Brandon Fusco (knee), receiver Cordarrelle Patterson (chest) and cornerback Marcus Sherels (shoulder) are probable. Peterson said Thursday the groin injury that has troubled him for almost two months is more of a concern than the foot injury. Peterson was even hesitant himself on Thursday about his status for Sunday’s game. He started last week, but sat most of the second half in Minnesota’s 42-14 loss at Cincinnati, which dropped the Vikings to 4-10-1. Peterson had 11 carries for 45 yards in last week’s loss and didn’t play after taking one carry on the first offensive play of the second half. 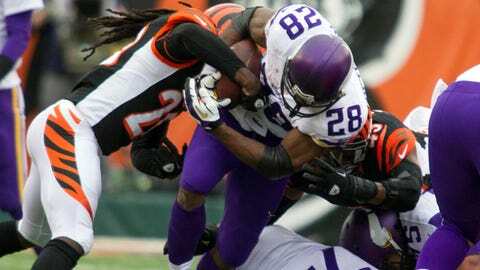 "The groin I would say more so than the foot," Peterson said of the injuries. "The foot was a pain that I already had set in my mind that I was going to have to deal with. Sometimes when I was pushing off, I felt it. I got tackled a couple of times and twisted up and pain kind of stuck around for a minute. But that’s something I knew I was going to have to deal with. "As far as explosion, that kind of hindered me a little bit, the groin as well. So, I felt uncomfortable Sunday." Frazier said simply sitting Peterson with only one game remaining isn’t a consideration. "No, no, if he could play, just like last week, he would be out there," Frazier said. "So if we felt like he was ready to go, he’d be out there on Sunday." Rhodes could make his return after missing two games with a sprained ankle, but Frazier said he likely wouldn’t start Sunday. "He did OK today," Frazier said. "So we’ll see how he feels tomorrow, see where he is … he’s missed quite a bit of time. We’d probably work him in there. But want to see how he feels tomorrow when we come back out here again. So, we’ll see."